Long Time Return group from Noblesville & Martinsville, IN. John & Trent Elmer, Phil Beer, Brian Cooley, Steve Dillinger, Steve Schwartz, Steve Eickman, and Mike Davis were all very glad to be back fishing at Fireside Lodge. 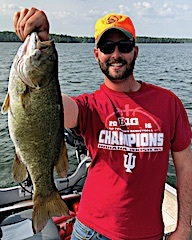 1st day fishing was great for John and Trent catching many Smallmouth Bass with Trent landing a beauty 18-inch Trophy Smallmouth plus they caught some nice size Northern Pike. 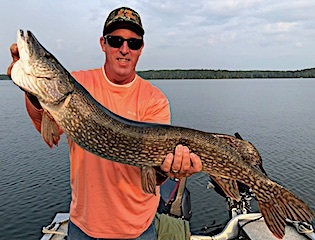 Brian and Steve H also had a fabulous day on bigger Pike with Brian catching a 40-inch Trophy Northern Pike plus he hooked and landed a huge 42-inch Muskie. 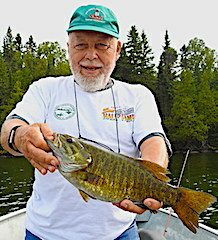 2nd day Steve Schwartz and Mike caught a lot of Smallmouth Bass up to 17.5-inches and some Northern Pike up to 32-inces. 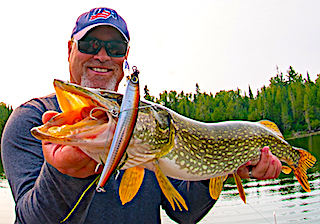 Also Steve said he had a MONSTER 4 footer come up a consume the favorite lure of the week which was a #6 Blue Fox Spinner, and he quickly replaced it at my tackle shop along with a few spares. 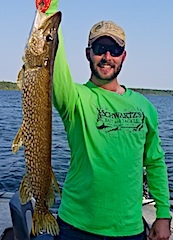 3rd day all said they had a great day with some catching a lot of Northern Pike in the 28 to 35-inch range while others did well catching Smallmouth Bass 14 to 17.5–inches. Trent came up with his 2nd Master Anglers Award Smallmouth Bass measuring 18.5-inches, and looking at the picture it was a horse of a fish. At supper John and Trent said they are having a fabulous time catching a bunch of fish and spending quality father and son time together. 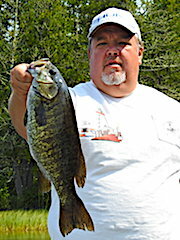 4th and final day all had a great finish catching many fish including several Trophy Smallmouth Bass and Big Northern Pike. 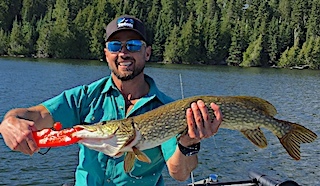 John had the tops for the day landing a 38-inch beefy Pike, son Trent caught another Master Anglers Award Smallmouth Bass at 18-inches making it his second Trophy. 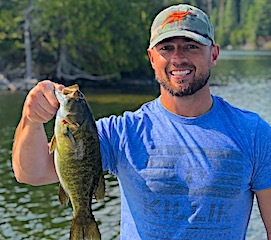 Brian was tops for the week catching a 42-inch Muskie, 40-inch Trophy Northern Pike and six Trophy Smallmouth Bass measuring 18-inches and one at 18.5-inches. That’s and awesome 4 days of fishing for anyone. All left having had a great time making many memories among family and friends. First Time Group made up of Frank and Jason Thompson from PA and Frederick, MD with Patrick and Kent McBride from OK and WV were all vey excited to be fishing at Fireside Lodge. The trip originated as a Christmas gift to Frank presenting him with a card giving him the gift of a fishing or hunting trip of his choice and Frank, after doing some research, decided on Fireside Lodge to be their fishing destination. 1st day they did really good all catching both Smallmouth Bass and Northern Pike, Patrick catching the fish of the day being a 17.5-inch Smallmouth Bass. 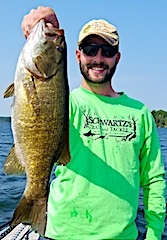 2nd day was great as Frank and Jason caught 23 fish, a good mix of Smallmouth Bass and Northern Pike, and Jason caught a Master Anglers Award Trophy Smallmouth Bass measuring 18.5-inches. Patrick and Kent caught as many fish with Kent having the hot had on Pike using an all white Rooster Tail. 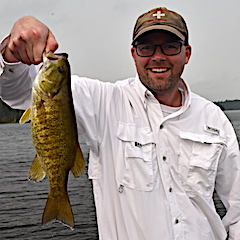 3rd day was terrific for Jason and Frank hooking up on 60+ Fish lading 33 Smallmouth Bass plus 1 Pike, all the Smallmouth Bass being 15 to 17.75-inches. 4th and final day they did well catching a variety of fish not being action packed as day three but that’s fishing as all good fishers know. All left saying the could not have had a better fishing trip together and Frank told me while grasping my hand that everything was terrific and could not have been better. 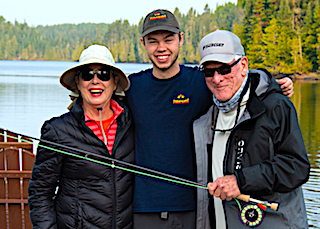 All made some great family memories, which of course is the biggest catch of all. 1st time Guests of Fireside Lodge were Linda Winthers & Barry Alan from Gold River, CA, Bob Larson from Crescent City, CA and John Harrison from Canby, OR. Their inspiration to visit us was through a long time guest Mike Ramsey from Penn Valley, CA. 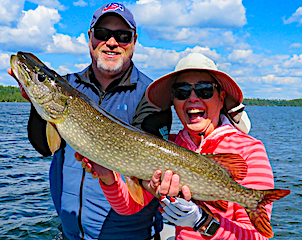 First day out for this group they did great catching some bigger Northern Pike and Linda stole the show landing the two largest fish 35–36-inches. 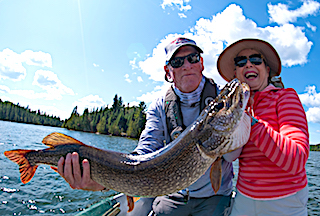 Catching one of the bigger Pike was a story as Linda had a tangle in her reel and just at the time it was solved, and as she picked up her lure, BANG the fish was there. This goes along with the theory of twitching, stopping, dropping, and changing direction of your lure to get fish to strike. The smiles in this picture really tell the story. 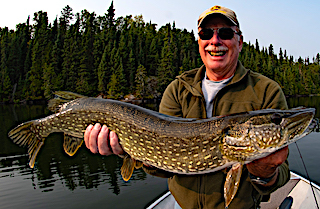 Barry is a very avid Fly-Fisher and his goal it to catch a Trophy Toothy Critter with his fly rod. 2nd day was very windy which was a challenge fly-fishing for Barry. Bob and John did well slow rolling in-line spinners catching a lot of Northern Pike and John had big follows from at least 10 different fish. 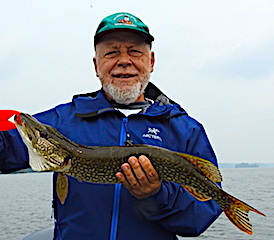 3rd day was great catching many Northern Pike, with Bob and John even having a double, sizes ranging all over the board. The Trophy toothy critters were still eluding them, even though they made contact with them getting follows. 4th and final day they did great catching many Northern Pike, Barry hooking into a very nice fish fly fishing, while Bob & John really got the hang of fishing the Yo-Zuri twitch bait they bought from my tackle shop. These are very effective lures if fished with the correct action, and they even had a double using this technique. The key is to make this lure look like a dying baitfish, taking some effort to do this as both John and Bob found out saying that they were feeling it in their arms by the end of the day. All left having had a fabulous time and are hopeful for a return visit. 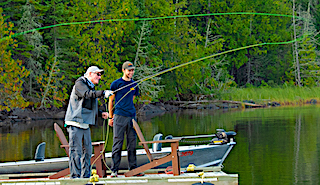 Also I wanted to give a BIG thanks to Barry for being so kind to spend some of his time teaching several young men the basics of fly fishing and creating a new interest in fishing for them.